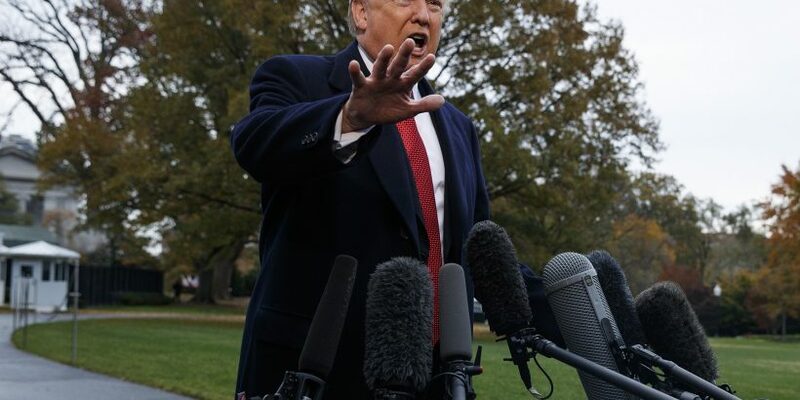 As he left the White House for a brief trip to France, CNN reporter Abby Phillip asked the president whether he wanted his new acting attorney general, Matthew Whitaker, to “rein in” special counsel Robert Mueller, as has been widely speculated. “What a stupid question that is. What a stupid question. But I watch you a lot and you ask a lot of stupid questions,” Trump said, jabbing his finger at her before turning and walking away. He then doubled down on his criticism of Acosta, known for his combative encounters with White House press secretary Sarah Huckabee Sanders and the president. “I think Jim Acosta is a very unprofessional man. He does this with everybody. He gets paid to do that … He’s a very unprofessional guy. Whether it was with me or Ronald Reagan, he would have done the same thing. I don’t think he’s a smart person, but he’s got a loud voice,” Trump said. He then turned his attention to National Urban Radio’s April Ryan — whom he repeatedly ordered to “sit down” at Wednesday’s contentious press conference. “It’s the same thing with April Ryan. You talk about somebody who’s a loser. She doesn’t know what the hell she’s doing. She gets publicity, and then she gets a pay raise, or she gets a contract with, I think, CNN. But she’s very nasty, and she shouldn’t be” he said. Trump pulled Acosta’s credentials Wednesday after Sanders accused him of “placing his hands on a young woman” during the heated presser. Acosta also called Sanders’ statement “a lie,” but the White House stood by the charge, and Trump on Friday denied the video Sanders released — which reportedly was created by a contributor to the wingnut website InfoWars — had been doctored. But multiple news outlets cited experts in reporting that the video was likely sped up, and as a result, makes Acosta’s hand movement appear more than it actually was.